How many times have you heard this after a car pulls out in front of a motorcycle? Or a motorcycle rider asks, “How could he not see me when it’s a bright, sunny day?” The truth is, he probably didn’t see you. On a clear day, my motorcycle shows up well from 288 feet away, which is a little shorter than a football field at 96 yards. From the same distance with a No. 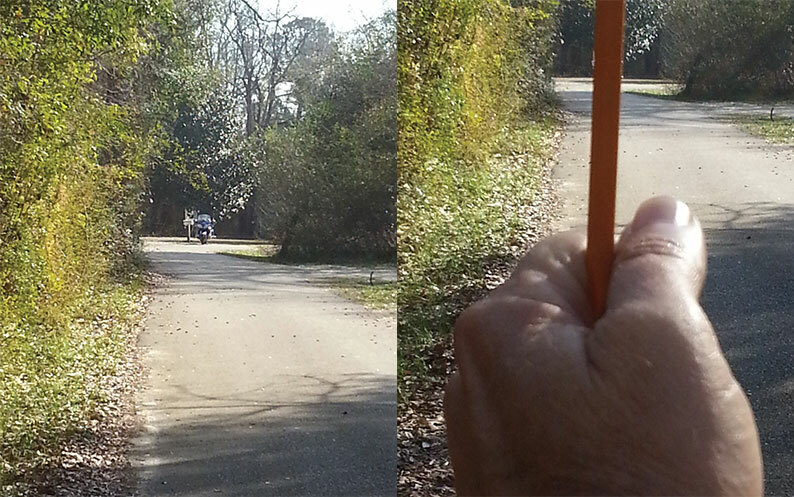 2 yellow pencil held up at arm’s length, the motorcycle is completely hidden behind the pencil. Now think of how wide a car’s windshield pillar / post is and you can see how it would be easy to not see a motorcycle. Also, remember that this is a full-dressed motorcycle, unlike the cafe racers (aka, crotch rockets) or even the smaller Harleys, Hondas, etc. Now you can understand how easy it would be to “not see him.” I crunched some numbers and found that a motorcycle can travel 288 feet in a very short amount of time. So even if a car stops and the driver looks left, then right, then left again, depending on the angle of the car, you could be out of view for a critical amount of time. That’s assuming the driver is not in a hurry and pulls out after only looking left, then right. Never assume a car driver sees you. This example may help you understand why. I have looked at this from both sides. As a motorcycle rider, I can see how a driver might “not see me” and continue to use caution when meeting a car ready to pull out into traffic. As a motorcyclist who drives a car, when pulling out into traffic, I have gotten into the habit of leaning forward while looking left the second time. It changes the perspective of my view around the windshield pillar or post that ensures there’s no one in that blind spot. I don’t ever want to say the words, “But I didn’t see him,” particularly about a fellow rider. Posted 04/25/2016 by wing & filed under Road Trips. Like you said about changing you perspective. I agree because I as a rider also operate different type of vehicles and equipment. My head does not stop moving as I am changing my perspective looking on all 3 sides. You make good points. Another is estimating speed. Cars and trucks are big objects and we estimate speed by the size change we see as it moves toward us. Bikes are small – pencil small as you so clearly show – and we don’t see the relative change of size. A woman pulled out from the right, right in front of me. I screeched to a stop, horn blaring and yelled “Didn’t you see me?” She answered, “I did, but thought I had time”. I didn’t continue to rant at her because she was right, she couldn’t judge how fast I was approaching because it was a bike, not a car or truck that she’s used to. Motorcyclist need to ride aware and add lateral motion if they expect to get noticed. It is how human vision works and we riders need to cater to it. I drive all over my lane. On a 2 lane road with approaching traffic I move to the right track. Should a second opposing vehicle want to pass, being in the right track gives them more time to see you rather than pop out partially or fully in your lane to see if it is clear. On multi-lane highways, I am in the left track unless I am passing, then the right track of the left lane. This allows the vehicle being passed, who may be considering pulling out to pass, to see you as you are closer to them and not hidden by the vehicle in front of you nor in the blind spot of the vehicle you are passing. Do not tailgate, if you cannot see about halfway under the car you are following you are too close. With a trailer it should be the 3-4 second rule, not the 2 second rule. And one most trailer pullers do not consider: I was passing two cars in AR in 1998. I had passed the first car and was coming up next to the second car when the car I had already passed, pulled out behind me to pass also. He did not see the trailer and when he pulled out he hit the trailer. I felt the bump, saw my trailer coming around me on the left. I realized what happened and gave it the gas to keep the trailer from jack knifing completely and taking me down. The trailer wagged the dog for a few seconds, I regained control and pulled off the road. The driver who hit me pulled off also. He told me he did not see the trailer. The only damage was a small dent in the trailer fender, but at speed there is so little weight on the tire contact patch it went sideways very quick. Whatever you do in this situation, DO NOT HIT THE BRAKES. If you do, the trailer will come around, the yoke will hit the bike and you will go down or loose control if you are on a trike. So watch out for people who you just passed wanting to pull out right behind you into the passing lane.